I have been wrestling with this issue intensively for three days now, and several different tutorials and searches still haven't helped. In my system Details, the processor is correctly identified as Intel, but after Graphics it just says NV126. I have a GeForce GTX 960 graphics card installed. No applications utilize the GeForce GTX 960 when they are run. During my last attempt, I completely reinstalled Ubuntu 18.04. Then I ran ubuntu-drivers devices which found my graphics card. After that I ran sudo ubuntu-drivers autoinstall. Then I rebooted, checked in Software & Updates under the Additional drivers tab that the nvidia-driver-390 option was selected instead of the xserver-xorg-video-nouveau option. But still in my system Details it just says that graphics are NV126, and the graphics card doesn't work. What does NV126 mean? How can I get the system to use my graphics card? According to nouveau/CodeNames wiki (freedesktop.org) NV126 is the codename for the GeForce GTX (950, 960) graphics card. This codename correctly matches your GeForce GTX 960 graphics card. 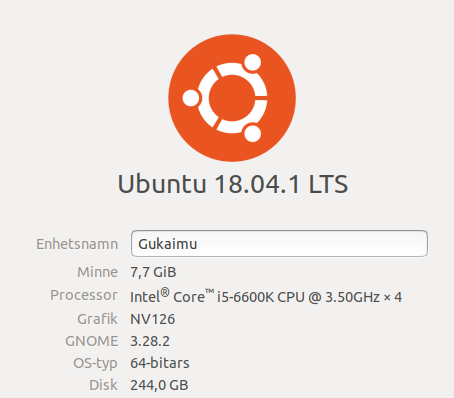 Settings -> Details shows the graphics card's codename in your Ubuntu 18.04. 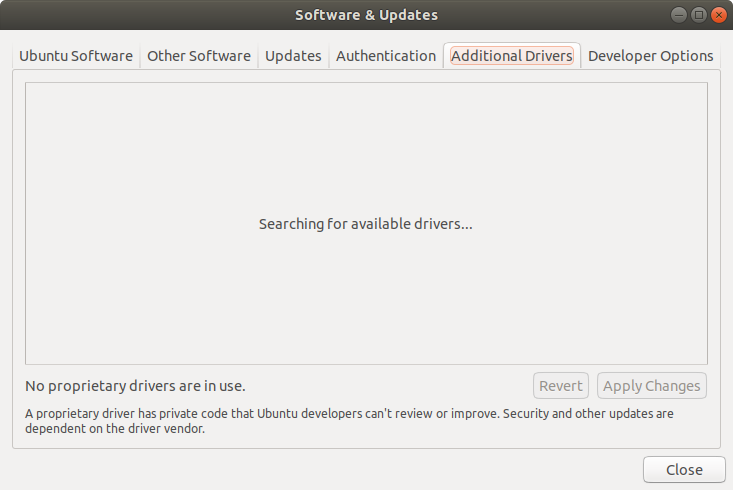 When you open Software & Updates and click the Additional Drivers tab, it starts searching for additional drivers and shows a screen like the below screenshot. As you can see in the bottom left corner of the screenshot it says No proprietary drivers are in use. while it is searching for additional drivers. Give the application a minute or two to finish searching and it will display a list of installed graphics drivers. The graphics driver that is currently being used has the radio button to the left of it selected. You can also install Tool for configuring the NVIDIA graphics driver (nvidia-settings) to show what graphics driver is currently being used. It does a better job of identifying the Nvidia graphics card model than the Sysinfo hardware information application does. To open the NVIDIA X Server Settings application search for nvidia in the Dash and click on its icon. Some applications require additional software to be installed to make optimal use of the Nvidia proprietary graphics driver. For example Blender's Cycles render engine requires nvidia-cuda-toolkit. The Compute Unified Device Architecture (CUDA) enables NVIDIA graphics processing units (GPUs) to be used for massively parallel general purpose computation. Not the answer you're looking for? Browse other questions tagged drivers nvidia 18.04 graphics ubuntu-drivers or ask your own question. Is Ubuntu recognizing and/or using my NVIDIA graphics card? Nvidia GTX 670 Not Compatible with Ubuntu?